No common failure links recent highly publicized crane accidents, but there are common solutions for crane incidents. They start with certification for operators and inspectors. An average of 22 construction workers died in crane-related incidents per year from 1992 to 2006, according to a report released June 17 by the Center for Construction Research and Training (CPWR), which derived the number from BLS data. The "Crane-Related Deaths in Construction and Recommendations for Their Prevention" report, spurred by tower crane collapses in New York City and Miami that killed 10 workers and one bystander this spring, listed eight recommendations. Certification of operators, inspectors, riggers, and signalpersons are the top three. That approach matches the thinking of Phillip Ezzell, co-founder and CEO of Crane Safety Associates of America Inc. (McDonough, Ga.) and the company's president, Shane Adams. California and 14 other states mandate that crane operators be certified to National Commission for the Certification of Crane Operators (NCCCO) standards, which is exactly what the CPWR report recommends first. "It [operator certification] is not a national thing," Ezzell said. "However, the construction industry is trying to police itself in that regard. The insurance companies are behind it. Large companies are requiring it. A lot is being done voluntarily." Adams noted that large contractors in Georgia, where NCCCO certification of operators isn't required, typically will not hire an operator who lacks it. "It really needs to be done nationally," Ezzell added. "I personally sort of feel like NCCCO is going to be a reference, consensus [OSHA-recognized] standard. It'll be a backdoor regulation." Asked when that might happen, he noted OSHA's long-awaited cranes and derricks negotiated rule is expected to be published soon and said he hopes it includes operator certification. "They're missing a golden opportunity if they don't," Ezzell said. Ezzell, Adams, and the CPWR report also call for crane inspectors to be certified. "We've got guys doing crane inspections who aren't looking for the right things," said Adams. Referring to corruption charges filed in June against the chief crane inspector in New York City's Department of Buildings, Ezzell said, "That certainly occurs around the country. There needs to be an assurance that these people are doing quality inspections. That usually is a state function." OSHA requires inspector certification only for maritime cranes, but California, again, has state requirements for its inspectors, he said. 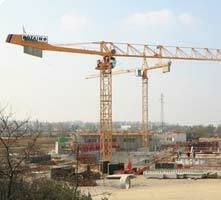 An operator also is required to perform safety inspections before operating a crane. "He looks for the obvious," Ezzell observed. "He's not going to take things apart and climb up on the rigging. He's not going to risk life and limb." Both men said the general public doesn't appreciate how many crane incidents happen in the United States. Tower cranes made headlines and TV news when the two New York City collapses and the 30-story fall of a crane section in Miami occurred from March 15 to May 30 this year, but other incidents--dropped loads, falling booms, overloads, cables breaking--happen without making national news, they said. A significant change Ezzell said he has seen since his days as an operator years ago is the disappearance of oilers, who were crane-operators-in-training on job sites. Apprenticeship training programs have faded as union power waned and nonunion construction blossomed, said Ezzell, who added that he believes the International Union of Operating Engineers and its locals around the country continue to provide the best crane operator training in the nation. Still, IUOE training serves mainly to replenish the union's ranks and does not help with training operators who work for nonunion contractors. Crane Safety Associates of America trains about 2,500 people annually to work on all three crane types: mobile, overhead, and tower cranes, Adams and Ezzell said. There is a nationwide shortage of operators, and the job is getting more technical to handle today's cranes, which are equipped with cameras and computerized LMI systems for calculating safe loads. "He has to be a pretty sharp guy," Ezzell explained. "The old second-grade dropout that used to be common in construction--he's not necessarily the candidate we need to have today." Asked about the measures announced June 24 by New York City Acting Buildings Commissioner Robert LiMandri, which include mandatory maintenance and repair histories for critical tower crane components, Ezzell said the changes should help to ensure contractors don't circumvent safety rules. For information about NCCCO certification, visit www.nccco.org. Founded in 1995, NCCCO says it tested and certified more than 50,000 operators in all 50 states during its first 10 years.